When a tooth breaks, it’s a race against time to prevent further damage to the nerve. Teeth can break as the result of an accident, decay, or hidden cracks. In the majority of cases, a broken tooth can be patched up with a filling, but if there is not a whole lot of tooth left, it is liable to break again. 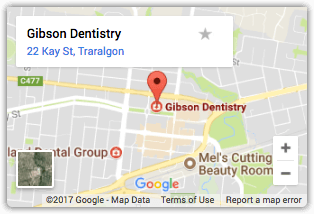 Every time a tooth breaks there is a chance the break will split the nerve, and then we’d probably be looking at rebuilding the whole tooth with a root canal and large filling. 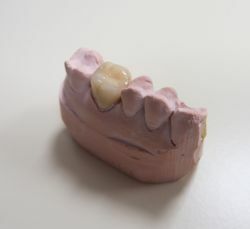 If a tooth has a history of breaking and is heavily filled, one other option to strengthen and protect what’s left of the tooth is with crowns (caps). Crowns are like a new shell or helmet for the tooth, that completely hold the tooth together. The added bonus is that crowns can be made to look just like a normal tooth. Crowned teeth are very strong. 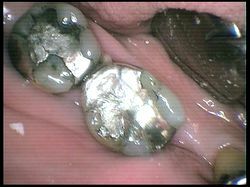 The photos below show old cracking amalgam fillings that would be suitable for protecting with crowns, a model of which is depicted on the right-hand photo.